Dog walking parks can be a great place to ensure that your faithful friend gets the exercise he needs to be healthy and happy. Today's busy lifestyle can take a toll on all family members, and pets are no exception with many becoming overweight and overanxious from the lack of proper exercise and attention. 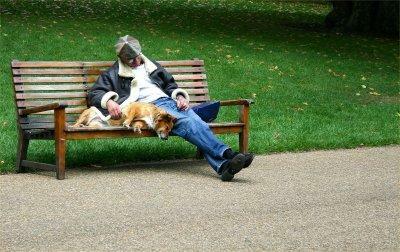 Often, pets spend long hours home alone while their owners are earning a living. Household tasks, children's activities and those endless errands take up even more time during the after work and weekend hours leaving Fido feeling quite neglected. Dogs are social animals that require time, attention and affection. Depression and attention seeking behaviors, like chewing household items or soiling indoors, often become a problem when those needs are not met regularly and are among the most frequent reasons listed for the surrender of pets to animal shelters. Obesity is another common problem today that affects approximately twenty-five percent of domestic dogs. The condition contributes to many health issues such as osteoarthritis, heart disease, respiratory problems and more. Overweight dogs tend to live shorter lives than average, and the quality of life can be severely affected. Regular exercise is among the most effective means of preventing these issues and the pain and expense of their management. Fortunately, dog walking parks are becoming more prevalent in neighborhoods today, providing a safe and convenient place for pet owners to ensure that their dogs have the opportunity to exercise and socialize. Designed with the canine friend in mind, these parks are often equipped with fenced, off-leash areas that offer plenty of room for Fido to run. Most have water fountains available to keep those puppy patrons hydrated, and some even provide agility courses that are great for training or active play. Before you take your furry friend to the local dog park, it is wise to attend to a few details. Many dog parks have regulations in place that require you show documentation that your dog has been properly vaccinated. These regulations are meant to prevent the spread of disease. Even if these regulations do not apply in your local park, making sure your dog is up to date on his shots is wise and ensures that his outings do not result in health issues. Another common requirement for the use of dog walking facilities in many areas is that dogs are licensed, so be sure that your paperwork is in order before you break out the leash and head off to the park. Another thing to consider before you head off to the dog park is how your dog interacts with others. If he tends to be excitable or to challenge other animals, some obedience training may be in order before exposing him to a crowded dog park. In many dog walking parks, poorly behaved animals can be banned from using the facilities, so you will want to be sure your faithful companion is prepared to play nicely with furry companions of all sizes and their people. If you are new to the dog park scene, perhaps the most important thing to remember is that all dog owners are responsible for cleaning up after their own pets. Whether the park is publicly owned or private, owners who leave doggie droppings behind can be banned. Dog parks in many areas have been shut down because of irresponsible dog owners who leave their messes for others to handle. This makes maintenance of the grounds expensive and troublesome. Be sure to put some plastic bags in your pocket as you set out to the park, and follow the golden rule of dog walking etiquette.